Today when I discovered that Moon was playing at my local independant movie theater, I was really excited. I’d read a bit about this low-key non-explodey science fiction film but since it hasn’t gotten a huge release so far, I thought I might just have to wait for DVD. Yet it just so happens that it is now playing in North Carolina, so yay for me! 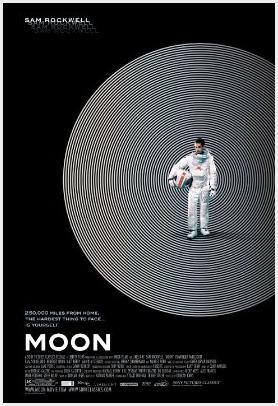 If you are like me, and a big fan of space in general, then Moon is worth seeing just for the awesome lunar setting and the 2001-meets-Grease Monkey aesthetic. Ultimately though, the moon itself is really just a backdrop for a character-focused scenario that is thoroughly-explored, if not quite totally original. I won’t spoil anything here, (and in fact, if you want to be completely pure, you shouldn’t even watch the trailer), but if you’re even moderately familiar with sci-fi tropes, you’ll guess the “mystery” almost immediately. To his credit, so does our hero. Sam Rockwell plays Sam Bell, a blue-collar astronaut on the last two-weeks of a 3-year contract. He’s been manning a mining station on the far side of the moon, harvesting helium-3 for shipment back home. It’s been a long three years, and he is more than ready to get back to his wife and the daughter he has never even met. Alas, poor Sam, he’s got science fiction to deal with first. The movie is less concerned with keeping “the answer” a secret than with exploring all of the implications of it, and while I might have liked a plot that I couldn’t guess five-minutes in, I did appreciate the depth and the emotion the film brought to mapping out all the details. There are little nit-picks. For example, whenever Sam is inside the lunar base, the film makes no attempt whatsoever to simulate lunar gravity. (The first shot is of him running on a treadmill.) While I could certainly understand the practical reasons for this, it did bug me. On the whole though, it was a very nice change of pace from the frenetic pace and big explosions of most scifi movies these days, and I can solidly recommend it to anyone who’s looking for thoughtful, character-based science fiction, or for that matter, anyone who just wants to ooh and ahh at all the shots on the lunar surface. July 10th, 2009 | Christiana | Tags: Moon.